For a long time there were a couple of helicopter companies offering tours from Port Douglas but sadly one of these companies is no longer operating. There is only one company now that offers helicopter tours from Port Douglas. As there is only one company now offering helicopter tours from Port Douglas, Port Douglas Reef Charters recommends booking any helicopter flights or tours in advance as not all helicopter tour options are available on demand. 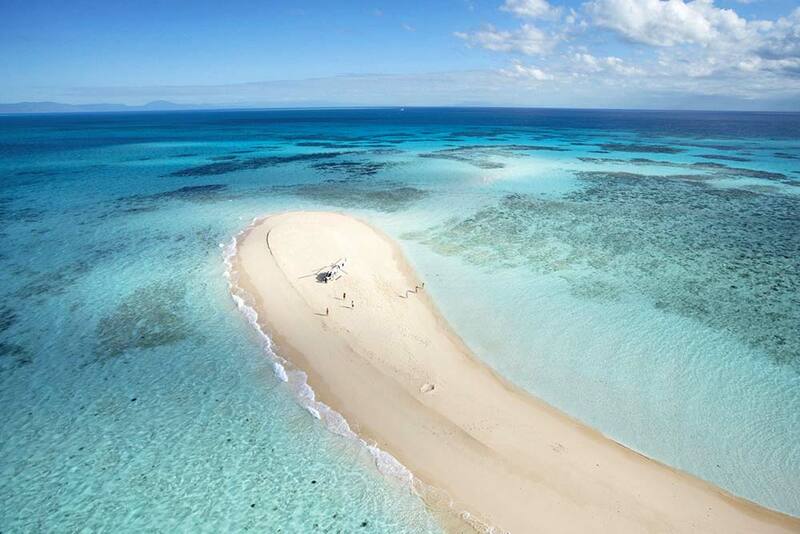 Flying to a remote sand cay is a very special tour option indeed and a very popular Port Douglas tour as well. It is quite romantic and often used as the perfect way to propose to or renew vows. There are some issues however that govern the use of the sand cays by helicopter as set by the Great Barrier Reef Marine Park Authority (GBRMPA). One such condition is that the chopper is not permitted to land on the sand cay if there are already people present. The cays are visited by local boat owners so during school holiday periods and weekends the chances of other people being at the cays are higher. If there is someone on the sand cay when you arrive there, the helicopter pilot will usually take you to a remote beach on the coastline that is fringed by rainforest. You will still have a beautiful beach to relax on, a scenic flight and a delicious picnic lunch as well as absolute privacy. Another occasional issue is that sea birds nest on some of the sand cays that the choppers visit. This means that the cays are closed to the public during nesting season, and sometimes the helicopter company will travel to a cay that is further away and therefore may cost more than the normal sand cay tour. If you wish to inquire about a sand cay flight prior to arriving in Port Douglas then you will be well aware of the heli tour options and cost prior to the day of travel. Tides also can affect the choice of sand cay for your chopper tour as some of the sand cays are underwater when there is a higher tide. This of course means that the helicopter will not have anywhere to land. Port Douglas Reef Charters can check out all the information for you prior to your arrival in Port Douglas. There is a large boat that departs from Port Douglas and takes 400 people out to a big pontoon that is permanently moored on the Great Barrier Reef. There are heli options for scenic ten minute flights from this Great Barrier Reef pontoon. You can also fly out to the Great Barrier Reef pontoon and cruise back to Port Douglas by boat. Or you can fly out to the pontoon from Port Douglas by helicopter and fly back to Port Douglas by helicopter. The availability of these heli tour options in Port Douglas are subject to availability and during peak periods may not be available. Port Douglas Reef Charters highly recommends booking these heli tours in advance. There is a lovely tour available to a private waterfall in the jungle which is part of the magnificent Daintree rainforest. The day starts with a pick up from your Port Douglas accommodation and a 5 minute drive to the helipad. The helicopter flies for 20 minutes or so over the rainforest to an isolated jungle waterfall. Your pilot will show you the best place to swim. A delicious lunch is also included in the price. After a couple of hours swimming and relaxing in the beautiful clear waters of the pristine jungle waterfall, you fly back to the Port Douglas base. The total duration of this tour is 2.5 hours. There are also some shorter scenic tours available from Port Douglas, starting at 30 minutes flying time and moving up to an hour of flying time. Prices for these tours vary according to flight times. Port Douglas Reef Charters has access to a 6 seater chopper for tours from Port Douglas or Cairns for larger family groups. Heli charters for documentaries and photography purposes can also be arranged by Port Douglas Reef Charters. There are choppers available that specifically have removable doors for filming purposes. As ghastly as it sounds, the most important information Port Douglas Reef Charters requires from customers interested in heli tours and flights is the individual body weight of the passengers. The helicopter pilot uses this information to calculate fuel usage for the tour. This information is required in advance by Port Douglas Reef Charters in order to assist you with your helicopter touring needs. This entry was posted in Daintree Rainforest, Great Barrier Reef, Helicopter Flights, Holiday tips and tagged beach, helicopter, jungle, Port Douglas, private, rainforest, romantic, sand cay, Tours, waterfalls.